From a warehouse find, this is a new, unplayed stock copy, in its original DJM factory sleeve. More unique Funk vibes from this veteran performer. The A side is specially edited from a much longer (6:08) album cut. Note: This beautiful 45 has no notable flaws, grading Mint across the board (Labels, Vinyl, Audio). 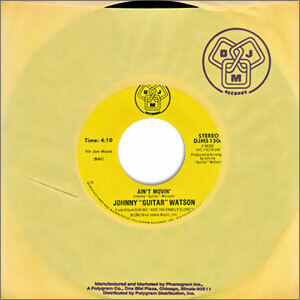 Condition Detail:Label: M | Vinyl: M | Audio: MWritten by: Johnny Guitar Watson (A&B)Produced by: Johnny Guitar WatsonChart info: Not charted 1981Track time(s): A: 4:10 | B: 3:42Mix: StereoOther info: Contains an edited version of the LP track.